Today we are going to talk about the most risky strategy of all times. However, the higher risk is, the better chances to win you have. So, what are the basic principles applied? The Martingale system is a negative progression strategy. You keep increasing the size of your wagers when lose. This strategy works for other casino games as well. Hazardous enough it is rather popular and can bring you a lot of cash. The main rule is to play with higher bets. In this case, if you lose for a couple of times you regain all your money within one lucky roll of a dice. However, it is not only about luck. Cold facts and mathematics are also count. I am sure high rollers will appreciate this system a lot. Exciting emotions, blood rushing through your veins brining you more and more cash as well as feeling of POWER and smart decisions made. All in one with simple steps to follow. Let's discuss them below. Note that the bets with even odds and even payouts are the best choice for you. For example, such advantageous bets are the Pass Line bet and Don't Pass Line bet. They both pay 1:1 and have a very low house edge. the lower the house edge, the better Martingale system works. There are different craps games online and you can find some allowing you to place bets with no house edge at all. 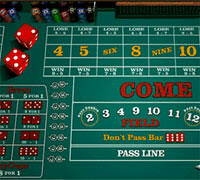 For example, you can look for craps casino with Any Seven bet that pays out true odds. In other words, no house edge is applied. To sum up: one of the Pass Bets and Free Odds bet is a perfect match for the Martingale system. Everything is simple. You start playing with 1 chip choosing among various denominations ($1, $5, $25, $50, $100 or more). When you win, you continue playing with 1 chip. You never increase your bet when winning. In case you lose, you double the number of chips. Keep doubling every bet when you lose. If you lose constantly, your 1 chip bet can turn into 4, 8, 16, etc. Just imagine you will be playing with $3,200 when you have 5 losses on your way. Of course, it is possible if you play with $100. If you happen to win, just return to your 1 chip bet. 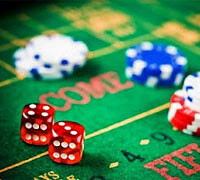 To play craps with Martingale system allows you to profit with 1 chip whenever you win, even after a meanwhile of losses. However, you should check the table limits. Why? Just imagine that you play with $100 chip bet and the table limit is $5,000. You won't be able to keep the pace of this strategy when lose constantly and come to $6,400 bet. You need to start with quite a large bankroll and place the minimum bet with minimum table limit. Thus, you have lots of room to increase your bets if you lose. Moreover, there can't be constantly losses, so sooner or later you win, just keep playing. Of course, to lose 15 times in a row is quite rare but still may happen. 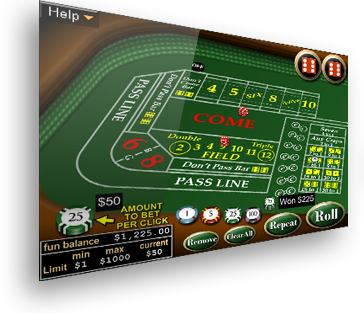 If you choose the craps game with large table limits and play with the large bankroll, you have good chances to win. This strategy is perfect for high rollers to play high stakes online craps.